Late last week, The Hub acquired three sitcoms to air in primetime beginning in April and one of them was The Facts of Life. That is still happening and we can't wait for that, but if you can't wait another month or so, TeenNick will ALSO air that totally '80s sitcom! Oooh, there's gonna be troubbbbbbbble! OK no, there's no trouble of two networks airing a show, as we all know. TeenNick will begin airing the Diff'rent Strokes spin-off on Monday (March 12, 2012) bright and early every weekday morning at 7:00am. It's early in the morning and just a half-hour, but it is certainly better than nothing! Facts of Life will replace one half-hour of Big Time Rush, which remains at 7:30am. Facts of Life will follow a block of Full House which airs weekday mornings from 5-7am. No other schedule changes are occurring on TeenNick besides this one. As of now, no other special marathons or airings of Facts of Life besides the weekdays at 7am slot. I guess 'you take the good and you take the bad.' Mmm hmm! Stay with us for continued updates! The Facts of Life is an American sitcom that originally ran on the NBC television network from August 24, 1979 to May 7, 1988. 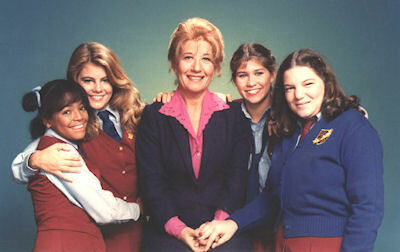 A spin-off of the sitcom Diff'rent Strokes, the series' premise focused on Edna Garrett (Charlotte Rae) as she becomes a housemother (and after the second season, dietitian as well) at the fictional Eastland School, an all-female boarding school in Peekskill, New York. NBC will continue to air The Voice on Mondays from 8-10pm, but on Monday, April 2 it will start airing live episodes now. NBC will also expand the singing competition series to a second night with live elimination rounds beginning on Tuesday, April 3 from 9-10pm ET. In addition, The Voice's last live performance episode will be on Monday, May 7 from 8-10pm ET, with the season's winner announced in a two-hour live finale on Tuesday, May 8 from 8-10pm ET. After that series ends its season, America's Got Talent - NBC's top-rated summer series -- will then debut its new seventh season the following week with two-hour episodes on Monday, May 14 and Tuesday, May 15 (both nights 8-10pm ET). The show's return will feature the first appearance of new judge Howard Stern, who joins fellow judges Howie Mandel and Sharon Osbourne. The series then resumes in its regular night and time on Monday, May 21 from 8-9pm ET and on Tuesday, May 22 from 9-10pm ET every week this summer. As a result of The Voice getting a second night this spring, NBC's The Biggest Loser will shrink down to one-hour from 8-9pm ET beginning April 3 and will have its season finale on May 1. NBC still has not yet announced its summer plans for Mondays from 9-11pm (following Talent at 8) and Tuesdays in between Talent at 9 (8-9pm and 10-11pm). Stay with us for the official NBC summer 2012 schedule, when announced, as NBC will get a jump start on the summer line-up with an in-season premiere of America's Got Talent.